Thinking about the fantastic pie-in-the-sky future is always a fun exercise. I, too, want a self-driving car. But some weeks, it’s clear everyone needs to come down to earth. This was one of them. Tesla sued two other electric vehicle companies focusing on self-driving for trade secret theft, proving that building this tech will be a grind. Peloton Technology let me hang out on its not-at-all-driverless truck, and explained how its approach could save lives and beat the robo-focused competition to market. What's more, we reflected on the one-year anniversary of the fatal Uber self-driving crash, which forced the industry to become more introspective and realistic about the limitations of its tech. OK, but that said: Plenty of others are making fancy transpo tech happen today. One of our reporters flew a helicopter with zero experience; another took to a mountain bike to explore the latest, greatest, and yes, superexpensive-est in bicycle technology. It’s been a week: Let’s get you caught up. Tesla went to (legal) war over intellectual property issues, suing rivals Zoox and XMotors.ai (plus some former Tesla employees) for trade secret theft. It’s over for you, drunk drivers: Volvo announces it will build inward-facing cameras into its new cars in the next decade to monitor driver alertness and attention. And it will cap all its cars at 112 mph. Welcome to the age of the smart bicycle, which might one day spot road hazards or adjust your suspension faster than you ever could. 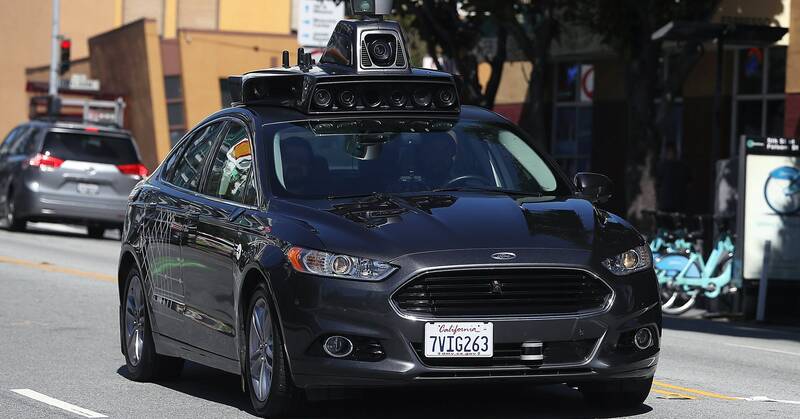 One year after a self-driving Uber struck and killed an Arizona woman, the industry is taking a more circumspect approach to the tech—including tamping down its predictions about when and where it will show up. Peloton Technology, the startup behind not-quite-autonomous truck tech, explained its approach to testing and safety—and why it’s not bullish on driverless trucks after all. Our reporter piloted a 12,000-pound Sikorsky S-76 helicopter, an especially fun and low-key thing to do with no experience. Good thing he was aboard the company’s Autonomy Research Aircraft, which it uses to study futuristic automated flying tech. Just in case you need a reminder: Jaguar has put together this less-than-two-minute reminder of how to you should sit while driving a car. Get used to adjusting, kiddos. That's the number of written driver's permit tests taken through Arizona’s one-year-old “Permit @ Home” program, which now allows, yes, learning teen drivers to avoid the DMV and take their permit exams at home. A licensed driver has to sign teens up for the program and promise to proctor. What’s to prevent people from cheating? “Your personal safety and your love for the child, of course,” an Arizona Motor Vehicle Department spokesperson said last year. “But your financial responsibility is going to make you think very hard about making sure the test is taken appropriately." The US Department of Transportation and the FBI have launched a criminal investigation into the certification process for the Boeing 737 MAX, the aircraft that crashed in Ethiopia last week. Union representatives for pilots flying with Southwest and American Airlines said those switching from the old Boeing 737 models to the newer 737 MAX 8 aircraft only took three-hour self-administered courses to do so—and that those courses did not mention the new software that may have played a role in the Lion Air crash in Indonesia last year. Meanwhile, President Trump nominates Stephen Dickson, a former Delta Air Lines executive, as head of the Federal Aviation Administration. Lyft’s IPO is oversubscribed, which means the company could surpass its targeted $23 billion valuation when it begins trading next week. Autonomous shuttle company Optimus Ride says it will launch more routes on private roads, this time in New York and California. EV maker Arcimoto announces an adorable new car: the three-wheeled Deliverator, purpose-built for, yep, delivery. Expect it to be a blast to drive. Ford will build a new factory dedicated to hybrid, electric, and autonomous vehicles in the next two years. Crosstown rival GM will spend $300 million to update a suburban Detroit factory for EV and AV production. Essential stories from WIRED’s canonSpeaking of top-of-the-line cycling: Ride along with one cyclist and his bullet-shaped, carbon-fiber and Kevlar steed as he competes in the Hour Prize, a competition to cycle at least 56 miles in one hour.